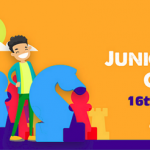 The 8th Gibraltar Junior International Chess Festival features 6-round opens in Under 16 and Under 12 sections taking place in the Caleta Hotel from 17-20 August. The total prize fund is £15,000. Players have 110 minutes for all their moves, with a 10-second increment per move from move 1.